When you have a login to our website, you will even be able to look at the current stock of our generating sets! Ask your dealer for actual stock positions. If you already know which generating set you need, you can use the Product Finder to obtain more technical specifications or pictures of this generating set. Afterwards you can create a Product Sheet of this particular generator. 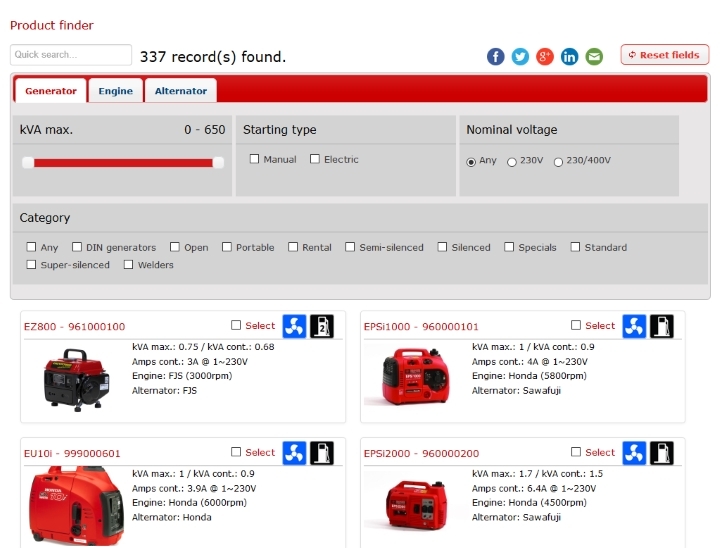 When using the Product Finder, you can tick the boxes of the generating sets you want to compare. Click the ‘compare’ button on the left side and the selected generating sets will appear next to each other. This way, you can easily compare the technical specifications of the different generating sets you are interested in. You can easily save your outcome in PDF format and/or print it out. As a Europower dealer, you can e-mail it to your customers or print a hardcopy. If you have a limited number of Europower generating sets in your warehouse, you can select all the models you offer and print these on A3 format poster. This way, you can use this poster in your showroom to explain the differences between the generating sets. As end-user, you might not have enough technical knowledge to decide which generating set suits you best. You can print or e-mail the outcome to ask a Europower dealer for more information. He will give you expert advice about the selected generating sets. Use the "Quick search" field if you know what you are looking for. This is very useful when searching for article numbers and generator types. The result will be filtered immediately after entering the second character. The number of records that is found will be shown next to the search field and will be updated according to your search. You can use the quick search in combination with other filter elements. One word -or part of a word- is more than enough to make the quick search work. If you use a filter combination that yields no results, you will see the following message: Please contact Europower to assist you in defining your generator. Underneath the filter, you can see a list of generators that meet the filter criteria. The result will show initial information such as: kVA max and continuous, Amps, engine and alternator. The type and the article number together with the thumbnail are both all clickable and will guide you to the product detail page. In the right corner you will find a checkbox. Use this checkbox to select generators. 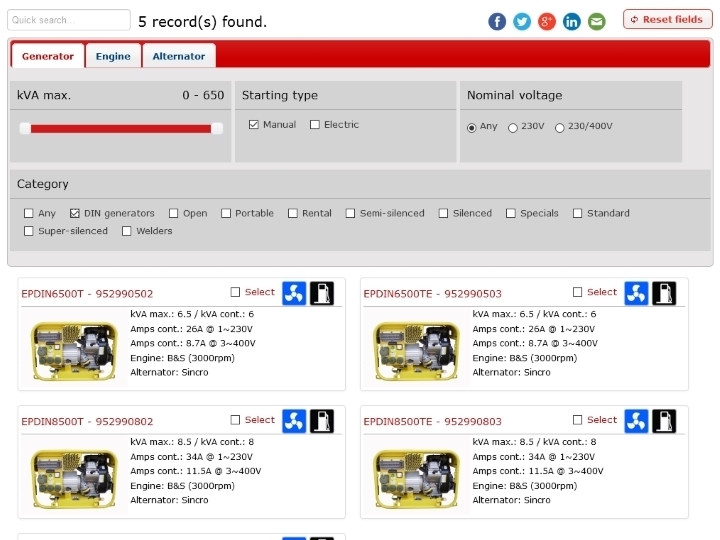 An extra menu will appear, showing the number of generators you have selected, together with a compare button, a button that will only show the selected items and a button to clear your selection. The selected items can be used for product comparison. The product finder also comes with social media buttons. The link behind the buttons is altered every time the filter changes. This can come in handy if you want to share the page you are looking at. If you used the filter, the person who follows the link will also see the product finder with the filtered items. Every time you add or change one of the filters, the previous filters will be remembered. You can use the “back” button from your browser to go to the previous filter. This way you do not have to start all over again. If you do want to start from scratch, use the “reset fields” button which will clear all fields back to default. If you are a fan of browser “favourites”, you can add any filtered page to your “favourites” for later use. This way you do not have to use the filter every time you visit the product finder. Try not to scroll down too much. Use the filters to restrict the number of results. If for some reason you need to scroll down because the result is too long, you can use the “Go to top” button that will appear at the bottom of the page. This will lead you straight back to the top of the page.